Edited by Peter Garrard, Professor of Neurology at St George’s University of London, and Deputy Director of the Molecular and Clinical Sciences Research Institute, UK. “This edited collection surveys and analyses the multidimensional problem of Hubris syndrome, and its deleterious effect on leadership within organisations. “The study develops an extended metaphor of the social and political ill of Hubris as a virulent, communicable disease of dysfunctional leadership, illustrating its ubiquity and potential for serious harm. 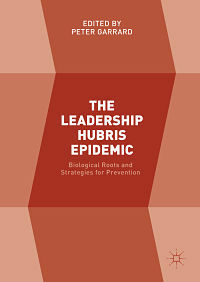 Taking a biological perspective to understand the possible underlying mechanisms as well as the environments in which hubris has been found to thrive, contributors emphasise the notion of prevention over cure. “Divided into three sections, The Leadership Hubris Epidemic examines psychological, neuroendocrinological and neuropsychological approaches to the biology of Hubris, explores factors that encourage or inhibit its growth, and finally provides methods for preventing or retarding its development.